Hi there! Welcome to Crafternoon Treats if you are here following the Stylecraft blog tour. I was very excited to be asked by Stylecraft to contribute a new pattern to showcase the lovely new colours in the limited edition packs of Stylecraft Special DK that are now on sale – Deramores has the pack for £9.99. I’ve used my pack to make a new bag – and I’m really pleased with it. Its different. It looks a bit like knitting. If you fancy making this bag for yourself, the links to all the tutorials you need are here. PS – don’t forget to go click here to enter the Stylecraft competition to win a free pack of all 10 limited edition colours first! The bag may be a bit more grown up but that doesn’t mean it doesn’t sing and zing with colour. The new shades in the Stylecraft limited edition pack are glorious and work so well together in this design. In case you don’t know how this pack came about, the colours were developed as part of a competition to choose a new shade of Stylecraft Special DK. People sent in all sorts of things to show their perfect shade and the winning 10 was chosen by a panel including Lucy from Attic24. The winning colour from this shortlist was won after a public vote by duck egg blue. The other nine colours, boysenberry (a rich dark pink), fuchsia (another rich pink but in a slightly lighter shade), cypress (a lovely sage green), grass green (bright and grassy), empire (a deep turquoise), pistachio (a pale yellow green) and mustard (a very mustardy yellow) were so gorgeous that Stylecraft have manufactured them all!! All 10 will be released in October as part of a limited edition pack. If you are going to the Knitting and Stitching Show at Alexandra Palace in London (7-11 October 2015) you will see them showcased on the Stylecraft stand. About the blog tour and the COMPETITION! Stylecraft approach several crochet bloggers and asked them to come up with a new, free pattern using the colours in the pack to show you just what you can do with them. Yesterday was the turn of Emma Varnum and tomorrow its The Twisted Yarn – but today, its me! The competition is now over and it was won on my blog by the lovely Vanessa from Australia! I hope you will love making this bag as much as I did. Its not a difficult project but its not going to fly off your hook in an evening. It takes a bit of practice to get the hang of the stitch but once you do and once you get going, each row is quick to make, the stitch becomes more rhythmic and, best of all, there is no counting. The way the colours work next to each other keeps your interest going and although this compacted form of the double crochet stitch grows more slowly than rows of standard dc, it works up pretty quickly compared to a blanket! Think you’ll need help? If you are a relatively new crocheter or you’ve just not attempted anything like a bag before, I’ll be featuring this the rainbow crochet tote bag as the bag of the month for October in the Bagalong Facebook group. You are very welcome to join us and chat about the pattern, troubleshoot, get advice and have a lot of fun in the process. This is a closeup of the lovely effect you get for the main bag by making waistcoat stitch in rounds, each in a different colour from the Stylecraft Limited Edition pack. And the handles – I’m really pleased with these handles. I think they are the most professional looking crochet bag handles I’ve done so far! I had great fun doing a photo shoot with the bag once it was finished. Three lovely friends and I went out for lunch then they took it in turns to model the bag to show its size and scale. At least half a ball – join me over the next couple of weeks as I’ll be thinking of a few smaller items to make with these gorgeous colours. I chose to use Stylecraft Classic Cotton in a coordinating burgundy to make the handles but you could use the lobelia for the outer handles and the boysenberry or fuchsia for covering the piping cord if you like. Or why not do multicoloured handles? Or two handles in different colours? It all depends if you want to add a bit of wild wackiness to your grown up bag! As with all my designs, I find it so thrilling when someone else makes it as the pattern shows but I’m delighted when the design is altered and tweaked – so go ahead and make this bag your own! 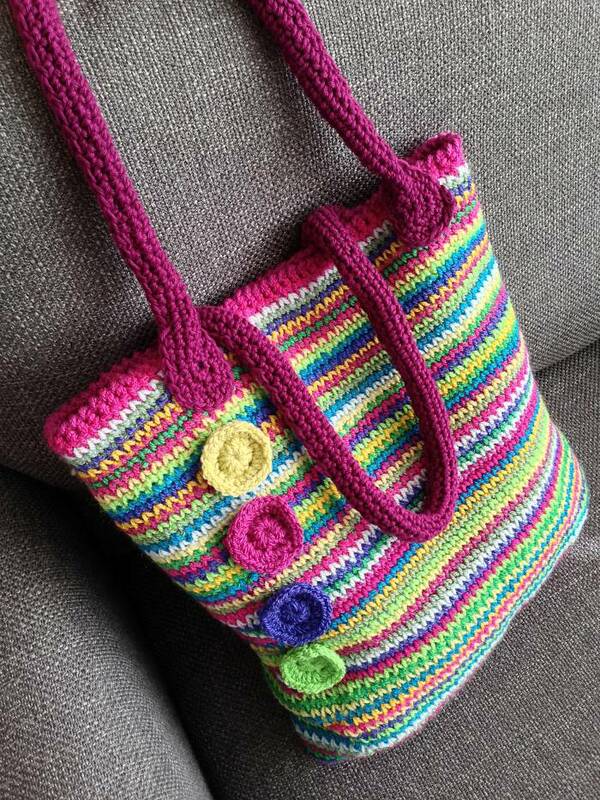 This entry was posted in Bagalong 2015, Crochet, Crochet bag, Rainbow crochet tote bag, Stylecraft blog tour. Bookmark the permalink. Your bag is just so cheery! I have never come across this stitch before, it really does look knitted! Fabulous idea! OMG! It’s lovely and it’s not knitted! I had to give up knitting due to M.E. so I’m thrilled to discover a stitch which looks like stockinette, but I can actually do. Thank you so much, you have made my day! Beautiful bag. I have been reading the Twisted Yarn’s blog and saw the link to yours. Do you have a quick clicky to allow me to follow your blog? I don’t see one. Lovely bag, Kathryn, well done! I’m loving your new tote and if by any chance I’m lucky enough to win the new limited edition yarns I will be making it. If I don’t win then I will just have to purchase the yarn to make it. I have not been this inspire before about making a tote, so this is going to be must make. Thank you Kath for your lovely pattern and clear tutorials.